Any online search you do about the place will give you the same basic story. Several of the School’s students disappeared between 1942-1952. 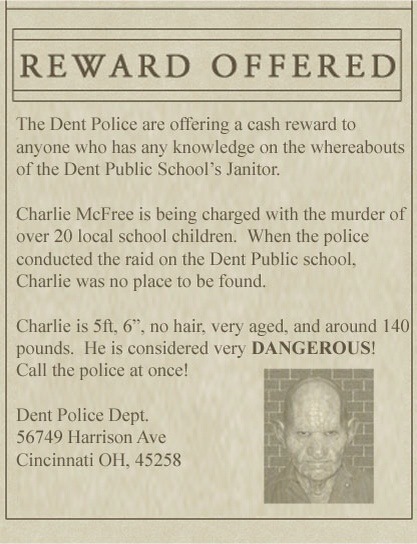 The legend goes that people noticed an odd smell coming from the basement of the School House, but the School’s janitor, Charlie McFree, convinced them it was backed up pipes. Things calmed down, but then the smell started again in 1955, after 7 more children disappeared. This time a mob formed and broke into the basement, finding the rotting corpses of the missing students. Charlie the Janitor was immediately suspected, but no one was ever able to find him. So now the School reportedly is haunted by the ghosts of the murdered children, and Charlie’s still around, looking for more victims! Of course, that’s just the made up back story for the haunted attraction. The problem is, a surprising number of people believe this to be a true story. Even the FAQ section of the Dent Schoolhouse website claims it really happened, and as I said before, this is the story you get from just about every site when you try to research the history. I’ll admit, I’m too lazy to actually go to the library or elsewhere and do further research on it, but a little common sense and deductive reasoning can tell you the story is fiction. Something like this would have been a BIG story, not something that could have been easily covered up, as some have said. There would have coverage on the news, in the papers, etc. Charlie would have become the local boogie man, everyone would have grown up worrying he was under their bed. There would be SOMETHING in the archives of legitimate media about the murders, but there isn’t a word….anywhere! And what about the families? There would likely still be brothers and sisters around at the very least. Or even classmates. There would be someone out there who would have protested them using the story of their dead friends and family for a Halloween attraction, especially here in Cincinnati. 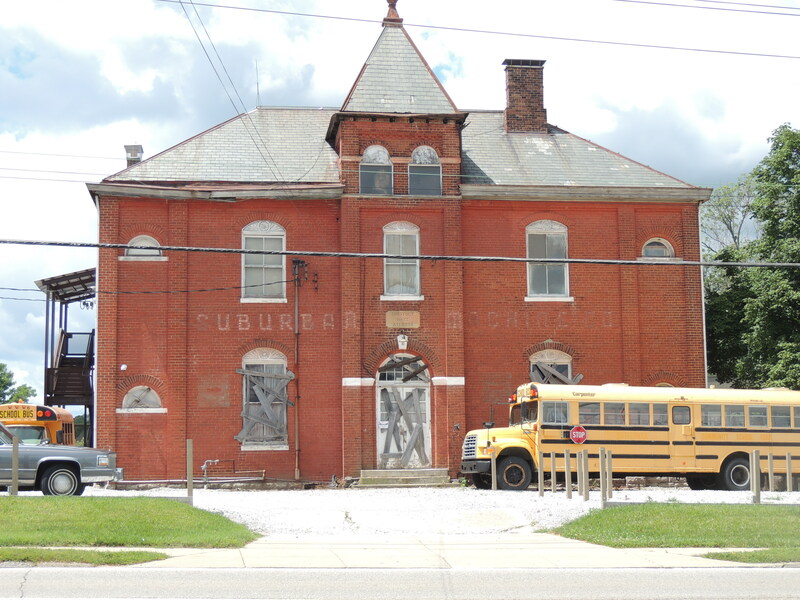 The Dent Schoolhouse is a great haunted attraction, but don’t confuse fantasy with reality. Charlie the janitor is a fun story, but he never existed. The Dent Schoolhouse is located at 5963 Harrison Ave. Check out their website HERE. This is a privately owned business, open to customers during hours of operation. They have started doing ghost hunts, so contact them for info. Yeah, I’ve never heard anything about it either, other than what WEBN made up about it. The first time I went to their haunted attraction, it was amazing. That was around 15 years ago, and it was easy to see why it was voted the best in the area. Then just a few years ago I finally went back, and it was terrible. I had to wait an hour just to buy tickets to get in, then another hour and a half in line to get in. By the time I got in, I guess all of the employees of the haunted house were on break, cause I barely saw anybody. Just a bunch of empty rooms. It was boring. Damn, now I’m interested to know the real history of the place lol. I know a lot of haunted house places seem to have that rumor about them that they’re REALLY haunted, but I don’t know of any that actually are, except maybe the Loveland Castle. This story is made up by the owners of the haunted house to drum up interest. NOTHING like this ever happened! For more information and a couple cool pictures of the school being built, check out the book “a Bicentennial History of Green Township” by joe Flickinger at the public library of Cincinnati and hamilton county. It was a part of the green township rural school district originally, then was a machine shop, then run by Boy Scout troop as a haunted house/Christmas boutique which at one time had one or two displays from the shillitos department store animatronic displays. It is now the big haunted house run by a private company which is a very popular attraction for the area. But, the story is made up!!! Hint: there was no “dent gazette” nor dent police!!! Rad the above mentioned book if you don’t believe me! I lived in Dent, Ohio for 18 years (1959-1972) and never heard of this place. I concur that is a made up story, especially since there was never a Dent Police Department that I am aware of. But it sounds like a fun place to visit! I am currently an actress of this haunted attraction and I am positive this place is littered with spirits. Walking the set alone with all of the special effects turned off, I have experienced numerous different phenomenons. On the first floor is where I had my experiences. After a long Friday night I was with one other Co worker going back to our scene on the first floor to get a left item there we both heard footsteps following us before we quickly ran back upstairs. No one else was on that floor at the time. There is also a bathroom on the first floor where a lot of people claim to be touched. I checked this out by myself and sure enough saw a white cloud cross my path while standing in this bathroom. There is for sure a lot of history in this building and if anyone would ask any workers of The Dent Schoolhouse, most of them will tell you this place is for sure haunted!! !